An enlightening mix of success stories, practical case studies, expert sessions and an interactive masterclass will provide finance and management accounting professionals with the skills required to drive finance transformation within their institutions. 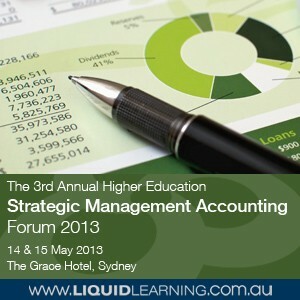 Follow this event on Twitter using the event hash tag #HEMA13 and @LiquidLearning for daily industry updates! The Higher Education sector is currently undergoing a period of significant transformation as it moves into a demand driven commercial environment. In order to thrive, the role of finance is evolving to cope with multiple interdependent forces. Through this complexity, success can be achieved with a clear and focused strategy that considers diverse information and allows decision makers to act with confidence. Understanding how to maximise research funding, utilise strategic budgeting and forecasting whilst creating realistic and competitive subject costing is a must. Engaging academics to encourage enterprise within universities is also essential to make this change. This conference will enable finance and management accountant professionals to develop their skills and knowledge to adapt to the changing face of finance in the Higher Education sector. This annual conference is a valuable opportunity for networking and to focus on challenges unique to the Higher Education sector.